Starting from v3, FirstSpot supports RADIUS Authentication Mode (in additional to ODBC Authentication Mode). Technically, FirstSpot acts as a RADIUS client (in RADIUS terminology, Network Access Server or NAS) which queries RADIUS server for AAA (Authentication, Authorization and Accounting) purpose. Normally, you should only use RADIUS Authentication Mode if you have another NAS that already uses RADIUS and you want FirstSpot to share that RADIUS directory. FirstSpot supports Microsoft IAS/NPS RADIUS server. For IAS/NPS to work, a DLL plug-in is needed. You can download IAS DLL sample source code at http://patronsoft.com/firstspot/sample/iasdllv6.zip . Note that this source code is only provided as is. You might need to modify it to suit your need. Also, if you need to integrate with your existing Active Directory (AD), you can setup IAS/NPS to read user accounts from AD. As RADIUS protocol is quite loosely defined on the Authorization part (second A), FirstSpot will probably work with other RADIUS server (e.g. FreeRADIUS) on the Authentication and Accounting part (first and third A) but not on Authorization (second A) . As an alternative, you can use Microsoft IAS/NPS as RADIUS proxy to other RADIUS server. Keep in mind that Microsoft IAS/NPS is free and it comes bundle with Windows Server OS. Please check out readme.rtf (within the trial package) for the exact version of RADIUS server we support. 3) Please also refer to section 9 (Setting up RADIUS server) of our firstspot_guide.pdf for some high-level information about how to make IAS to work with FirstSpot. Note that without the DLL, FirstSpot (v4.0.9 or newer, see http://patronsoft.com/forum/viewtopic.php?t=945 ) will still work but with only login/logout (i.e. no other user attributes like timeleft). 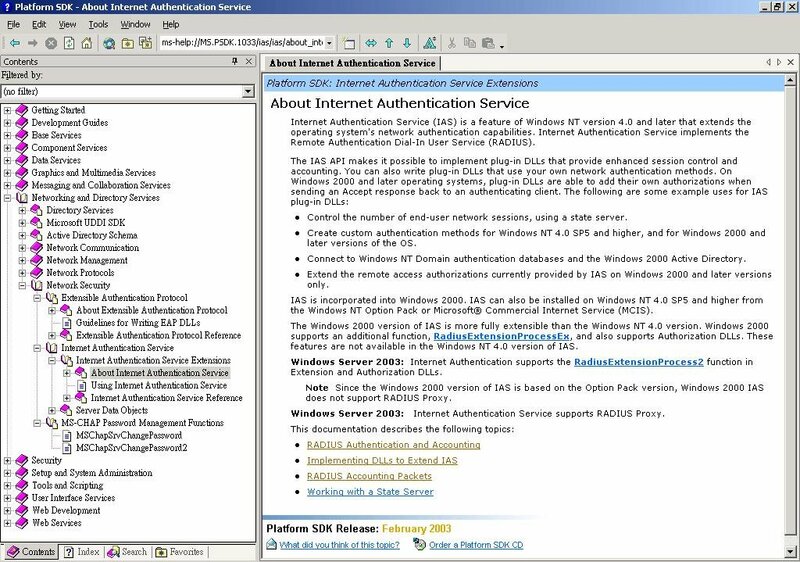 In other words, only Authentication/Accounting but no Authorization since the DLL is used to implement other user attributes (i.e. Authorization) . This is due to the design of IAS/NPS and the fact that RADIUS is more a protocol for Authentication and Accounting (the first and third A in AAA) but not Authorization (the second A). Another confusing aspect of the RADIUS support is WPA/WPA2 (Wi-Fi Protected Access) Enterprise. Many APs currently support RADIUS through WPA/WPA2 Enterprise. In this case, the AP acts as a RADIUS client. Note that FirstSpot also acts as RADIUS client when RADIUS Authentication Mode is enabled. The two (AP and FirstSpot) RADIUS clients do not communicate with each other directly. In fact, in most Wi-Fi hotspot (or guest) networks, we don't recommend turning on WPA/WPA2 Enterprise, as it might confuse end-users and also they will need to login twice (AP and FirstSpot).